Let’s further suppose that you log off the Console and then, sometime later, need to log on and re-run that very same search. How do you do that? Easy: you just retype the entire query, making sure that the attribute names are spelled – and cased – correctly and that the parentheses are all in the right places and that – well, you get the idea. And yes, that’s what we were thinking, too: surely there has got to be a better way to rerun your Console searches. And, as it turns out, there is a better way. In fact, there are actually two ways to save and reuse search queries: search history and search filters. Before you ask, yes, there is a difference between the two. Searches are automatically saved for you in your search history (and have a limited lifespan). By comparison, you must explicitly save filters. However, once saved, those filters can theoretically last forever. And if that doesn’t clear things up for you, that’s fine: we were just about to show you how all this works. 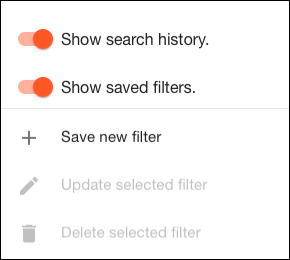 As you might have guessed, our focus for the moment is on the first two items in the list: Show search history and Show saved filters. 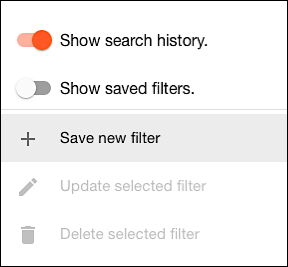 To re-enable Show saved filters, just click the option again. Search 1 is removed from the history, and that deleted query cannot be restored. Does that mean Search 1 is lost forever? Yes, if you’re relying on search history alone. But that’s not the case if you decide to save your query as a saved filter.